World Stroke Day is coming on October 29th, and the Harrisburg stroke care experts at Home Care Assistance would like to raise more awareness about this disease. 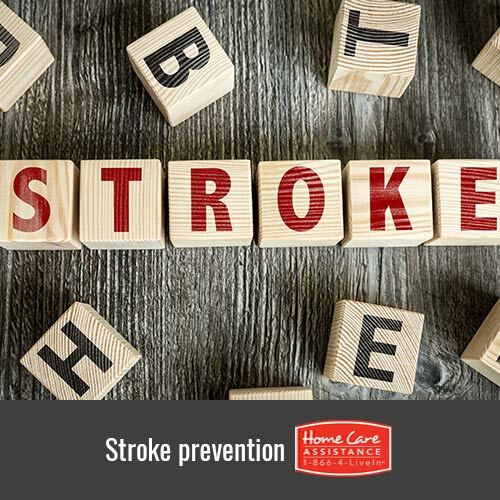 If you have an aging loved one with a high stroke risk, encourage him or her to follow these 5 stroke prevention tips. High blood pressure is one of the prime risk factors for strokes, and people with normal blood pressure have approximately half the lifetime risk of having a stroke as someone with hypertension. Physical exercise reduces blood pressure by strengthening the heart and helping it pump more efficiently. Exercise can also decrease your loved one’s risk of developing diabetes and cardiovascular disease, two conditions that increase the chances of having a stroke. When consumed in excess, alcohol can increase blood pressure. A study conducted at Tulane University showed the risk of ischemic stroke was raised as alcohol intake increased. Another study performed by researchers at the University of Cincinnati found having more than 2 drinks a day increased the risk of hemorrhagic strokes, which are most common among women. Eating foods high in saturated fat and cholesterol can raise blood cholesterol levels. Cholesterol can form sticky plaques that adhere to arteries and increase the risk of blood clots. According to the American Heart Association, the ideal diet for preventing strokes is one rich in whole grains, lean proteins, fresh fruits and vegetables, and low-fat dairy. As a general rule, fat intake should comprise no more than 25 to 35 percent of your loved one’s daily calories. Smoking is perhaps the biggest risk factor for strokes. Even being exposed to secondhand smoke by living with a smoker can increase your loved one’s stroke risk by up to 30 percent. If your loved one finds it difficult to quit smoking, he or she should talk to a doctor about nicotine replacement therapy, support groups, and other techniques that can increase the chances of quitting successfully. Certain medications can reduce the likelihood of developing blood clots. The easiest and most inexpensive regimen is low-dose aspirin therapy. Depending on your loved one’s medical history, a doctor may also recommend prescription anticoagulant medications. If your loved one has had a stroke or needs help managing his or her health to reduce the risk of strokes, reach out to Home Care Assistance. Our caregivers can assist with mobility and exercise, prepare healthy meals, provide medication reminders and transportation to appointments, and help with many other daily tasks. For more information on the elder care Harrisburg, PA, seniors rely on, call (717) 540-4663 to schedule a free in-home consultation with an experienced Care Manager.